Lopirel Plus tablet: Each film-coated tablet contains Clopidogrel Bisulphate INN 97.880 mg equivalent to Clopidogrel 75 mg and Aspirin BP 75 mg.
Lopirel Plus is a fixed-dose combination drug containing Clopidogrel and Aspirin. Clopidogrel is an inhibitor of platelet aggregation. Clopidogrel selectively inhibits the binding of adenosine diphosphate (ADP) to its platelet receptor and the subsequent ADP-mediated activation of the glycoprotein GPIIb/IIIa complex, thereby inhibiting platelet aggregation. Clopidogrel also inhibits platelet aggregation induced by agonists other than ADP by blocking the amplification of platelet activation released by ADP. Aspirin is also an antiplatelet agent. Aspirin acts by causing irreversible inhibition of the cyclooxygenase enzyme, which leads to decreased formation of thromboxane A2 and ultimate inhibition of platelet aggregation. For patients with a history of recent myocardial infarction (MI), recent stroke or established peripheral arterial disease, Lopirel Plus has been shown to reduce the rate of a combined endpoint of new ischemic stroke (fatal or not), new MI (fatal or not) and other vascular death. For patients with acute coronary syndrome (unstable angina/non-Q-wave MI) including patients who are to be managed medically and those who are to be managed with percutaneous coronary intervention (with or without stent) or CABG. Lopirel Plus has been shown to decrease the rate of a combined endpoint of cardiovascular death, MI, or stroke as well as the rate of a combined endpoint of cardiovascular death, MI, stroke, or refractory ischemia. 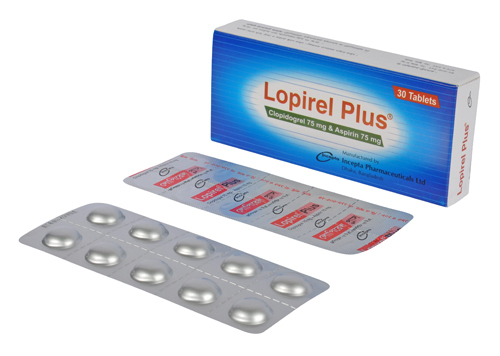 The recommended daily dose of Lopirel Plus one tablet daily. For patients with acute coronary syndrome (unstable angina/non-Q-wave MI), Lopirel Plus should be initiated with a 4 tablet stat loading dose and then continued at one tablet daily. Pediatric Use: Safety and effectiveness of Lopirel Plus in the pediatric population has not been established. The drug is generally well tolerated. Side effects that have been reported include abdominal pain, dyspepsia, gastritis, diarrhea, nausea, vomiting, constipation, gastrointestinal hemorrhage, ulceration, neutropenia, rash, palpitation, syncope, drowsiness, asthenia, neuralgia, paresthesia and vertigo. General: As with other anti-platelet agents, this combination drug should be used with caution in patients who may be at risk of increased bleeding from trauma, surgery, or other pathological conditions. If a patient is to undergo elective surgery and an anti-platelet effect is not desired, Lopirel Plus should be discontinued 7 days prior to surgery. GI Bleeding: The combination of Clopidogrel and Aspirin prolongs the bleeding time. So, it should be used with caution in patients who have lesions with a propensity to bleed (such as ulcers). Thrombotic thrombocytopenic purpura (TTP): TTP has been reported rarely following use of Clopidogrel. Reye\'s syndrome: Reye\'s syndrome may develop in individuals who have chicken pox, influenza or flu symptoms. This combination is not recommended for use in patients with chicken pox, influenza or flu symptoms. Nasal polyps or nasal allergies: The combination drug of Clopidogrel and Aspirin should be administered with caution in patients with nasal polyps or nasal allergies. Hepatic or Renal Impairment: This should be avoided in patients with impaired hepatic and renal function. Aspirin causes sodium and water retention in patients with renal impairment and increases the risk of gastrointestinal bleeding. Pregnancy: Adverse effects are increased in the mother and the fetus following chronic ingestion of Aspirin. Because of possible adverse effects on the neonate and the potential for increased maternal blood loss, Lopirel Plus should be avoided during the last three months of pregnancy. Lactation: Lopirel Plus should be avoided in nursing mothers because of the possible risk of developing Reye\'s syndrome. Regular use of high doses of Aspirin could impair platelet function and produce hypoprothrombinemia in infants if neonatal vitamin K levels are low.